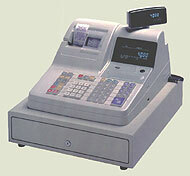 The CE-4000 Electronic Cash Register has many powerful features and functions for your business. The CE-4000 has up to 30 departments that can link to goups, 500 PLU's, and 15 clerks. The clerks function for the CE-4000 is very useful. There are 15 clerk secret numbers, training clerk specification for each clerk, and 2 commission rates and totalizers for each clerk allow automatic commission calculation. Please wait, brochures may take a few minutes to download. Dot matrix alpha-numeric system; 24 digits, 3.0 lines per sec.